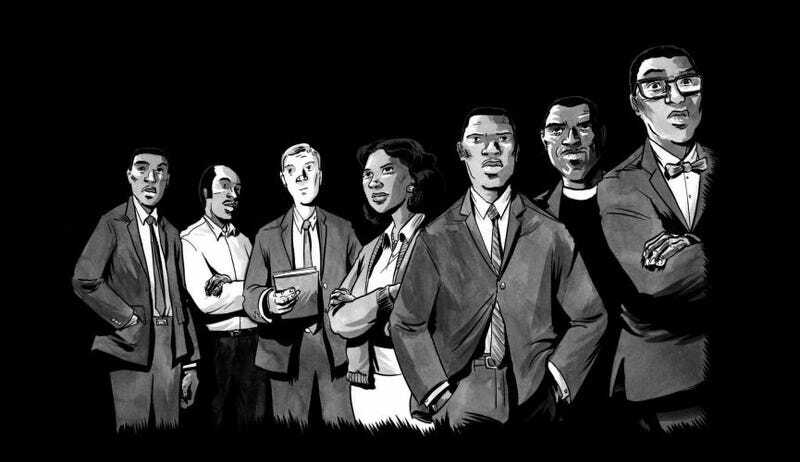 Three years ago, Representative John Lewis published the first book in a three-part graphic novel series about his experience as a leader for the Civil Rights Movement. Today, March is one of the biggest books in the country, selling out on Amazon overnight. And it’s all because the next president decided to pick a fight. Earlier this week, the Georgia congressman announced that he would not be attending President-elect Donald Trump’s inauguration. He added that he doubts the legitimacy of Trump’s election, given recent revelations about Russia’s attempts to sway public opinion in Trump’s favor. Doubting a presidency isn’t something Trump is unfamiliar with, given his years of claiming President Barack Obama wasn’t born here. However, instead of agreeing to disagree, Trump attacked the congressman’s credibility on Twitter...on a weekend celebrating the Civil Rights Movement Lewis fought and nearly died for. Representative John Lewis may have been derided by the next president for being all “talk, talk, talk,” but his decades of civil rights advocacy speaks volumes about how much he’s actually done. So it’s no surprise that his completed graphic novel memoir, March, soared 106,700-percent in sales on Amazon. It’s currently the number-one book on the site, up from #237, and it’s sold out. The individual books in the graphic novel series, which are still available, have likewise surged in sales. Amazon is also sold out of Rep. Lewis’ biography, Walking With The Wind. March, co-written by Andrew Aydin and illustrated by Nate Powell, dives into Lewis’ upbringing during Jim Crow-era segregation and goes through his civil rights advocacy into the first March From Selma To Montgomery, which marked its 50th anniversary in 2015. It was a New York Times bestseller and the first graphic novel to receive a National Book Award, and there are plans to possibly turn it into an animated series.